Tripura MBBS Counselling 2018:After the completion of the 15% seats in AIQ counseling, the Tripura NEET Counselling will begin. The counseling will start in the first week of July 2018. The counseling is conducted in the state and will organize by the Directorate of Medical Education, Health and Family welfare by the government of Tripura. The counseling is conducted to offer various degree courses in MBBS and BDS. 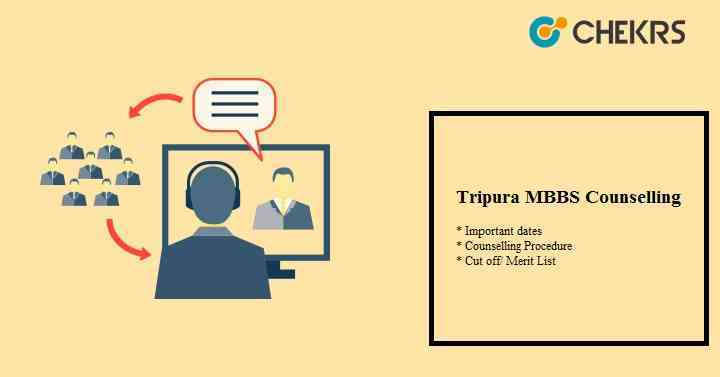 Applicants who are going to attend the Tripura MBBS Counselling is required to know the dates. The registration of Tripura MBBS Counselling is start form the month of June. The Tripura MBBS Counselling Dates are given below in the table. Firstly applicants are required to fill the application form on the official website through online mode. When the application form is accepted candidates are invited for the counseling according to their rank obtained by them in the exam. in the first round of counseling, applicant are required to present face to face in the informed date and time alongside with the required records/document. Applicants are required to fill the choices of the college and required to pay the fees. The verification of document also held in this process. On the basis of the rank obtained by the candidate in the NEET exam and the choices filled by the candidate, the seats are allotted to the candidate. With the admission letter, applicants are required to report at the assigned college. Before the deadline of the counseling, applicants are required to take the admission in the colleges. The Tripura NEET Cut Off include the ranks and scores of the candidates who are last to secure the admission. The applicant can check the NEET cut off to get the admission in the colleges which are participating in Tripura MBBS admission 2018. The Tripura NEET Reservation Criteria is given by the government of Tripura for various categories. The criteria for the Tripura NEET is as given below the table. The Tripura MBBS Merit List is released in the first week of June. The merit list is prepared on the basis of the NEET result. Applicants whose name come in the merit list are eligible for the counseling. The Tripura Merit List contains the details such as candidate’s name, NEET score, NEET roll number, state rank and the category of the candidate. Applicants can check the merit list from the official site. The information provided here is according to the official notification. If the applicant faces any of the queries regarding the counseling kindly contact us through the comment box.